You can create an online writing portfolio in just a matter of hours – really! This ebook details 5 elements writing samples should have -- and shows you step by step how to produce them so you can start landing freelance writing jobs fast! 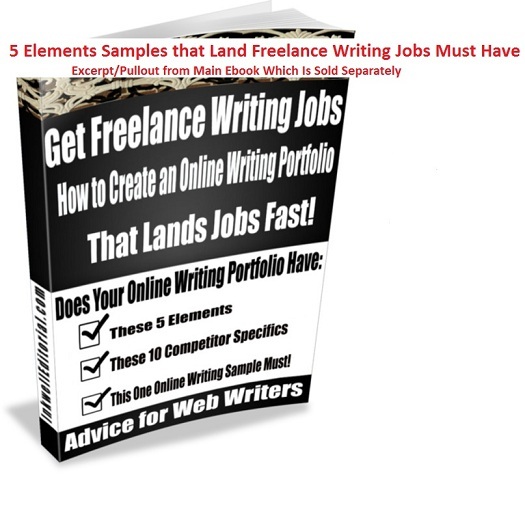 The following is an excerpt (a pullout) from the ebook, Get Freelance Writing Jobs: How to Create an Online Writing Portfolio That Lands Jobs Fast! Advice for Web Writers. This is the portion that details the 5 key elements all writing samples should include, which is discussed in STEP I in the full version of the ebook. One of the things that scare the bejeezus out of most new freelance writers is not having any experience; hence, no writing samples to show clients. If a client asks to see their “portfolio of work,” most are stumped; they’re literally terrified of being asked this question. But, there’s no need to be. You can create an online writing portfolio in just a matter of hours – really! And, start landing freelance writing jobs – online and off -- almost immediately. How do I know? Well . . . because I’ve done it! I created my SEO writing portfolio in a matter of hours – and went on to land 14 jobs in one week (and many more since then), which I detail in the ebook, How to Make $250+/Day Writing Simple, 500-Word Articles. (iv) Travel, live and work abroad, which I talk about in the free ebook, Living the Freelance Life! Learn How I Live Internationally and Have Made My Living Completely Online (Since 2007) & You Can Too! (subscribe from any page of InkwellEditorial.com to get it). This ebook is a step-by-step guide that shows you exactly what you need to do to put together an online writing portfolio that will impress clients – and start landing you freelance writing jobs quickly. No Experience as a Freelance Writer; No Writing Samples – No Problem! Just because you don’t have experience does not mean that you can’t market for – and land – freelance writing jobs. After all, we all have to start somewhere, right? Well, the info here will not only get you started – it’ll put you on the fast track to landing jobs just like experienced freelance writers. With that being said, following is a complete Table of Contents, which details the five steps you need to take to create an impressive freelance, online writing portfolio. Good luck in your freelance ventures!